Everyone knows that the casino with the most flash often gets the most business. So, if you are looking to take a few dollars out of your friends' paychecks on Saturday night, lure them over with the X10 Ten Player Automated Poker Table. 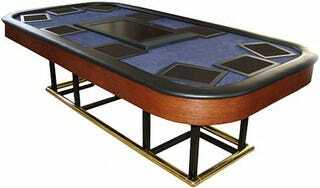 It features 10 12.1-inch touchscreens for the players and a 27-inch LCD in the center of the table that handles community cards and chip amounts for the entire table.